The New Pyramyd Air Website is in Beta. Cheque it out! The Pyramyd Air website got a face lift!!! For those of you, like me, that are allergic to change of any kind, there's good news. You can still access the old version of the website at Pyramyd Air. The new layout is still in the "Beta testing" phase, so in order to see it, you'll have to go to the following url for the time being: /airsoft. Truth be told, I'm actually pretty happy about the change. I think the new site is much more navigable and user-friendly. 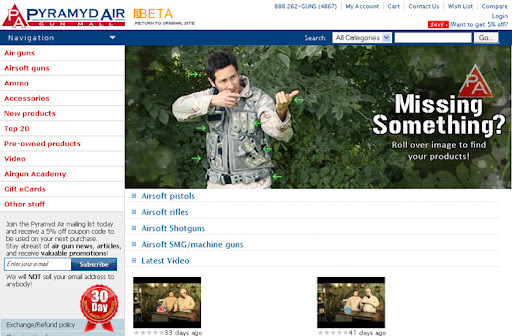 Compare this image with the one included within the first image I posted of the main Airsoft page for Pyramyd Air's new website. Nope, I did not "Photoshop the rifle into that handsome fellow's hands (n.h.) in the second image. It's just a cropped screen shot of my web browser when I hovered my mouse cursor over one of the little green arrows you see all around his silhouette. Once the category you're looking for comes up, you can click the item and it will link you to that page of products. The more traditional way to do it if you're not into living life in the fast lane is to simply use the navigation panel on the left-hand side of the screen. Working from left-to-right, top-to-bottom in the image above, you will now have filters of all kinds. 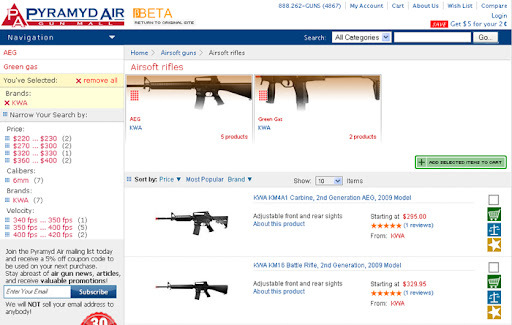 I've selected "Airsoft rifles" as my main category from Pyramyd Air's main Airsoft page, which you can identify by the level indicator links just below where it says "Beta, Return to the Original Site" at the top of the page. The only active filter I've selected within "Airsoft rifles" is the manufacturer filter for KWA. I have chosen to only look at KWA rifles on this particular search (because I'm excited about their new Mk23 SOCOM GBB Pistol that you see in my hand on the left). From there, you've got the other options that you see in the left-hand column like Price, velocity and also whether you want to look for an Airsoft AEG or an Airsoft gas blowback rifle. Just above the product images, you can see there is now a "Sort" feature that allows you to sort by price, popularity (it's the most important thing in life) and, if you've got multiple brands filtered, then you can sort by brand as well. Just to the right of the "sort" controls is a feature that will allow you to choose the amount of products listed on that particular page before you have to click a link to go to the next page (if applicable). Once I get my search narrowed down the way I like it when I'm shopping for new goodies, I usually just like to select the option to show all items on that page so that I don't have to waste time waiting for additional pages to load if there are a lot of results in my search. On the far right of the image above, there are four colorful boxes. Going from top to bottom, the first box is a "Checkbox" for product comparison purposes. Check the box for each product you'd like to compare and then select the third box down that has the "Scale" icon to compare all your items. The "Shopping Cart" box is pretty obvious, I think, especially since I just gave it away by giving the icon a title. I'll let you guess what this does. Fact: the more stuff your shopping cart has in it, the more of a man or woman you are than your peers. True story. Fourth, and finally, the "Star" button is a sweet button for the "collector" (which I am using to polity describe people like me who are borderline guns & gear "hoarders"). Clicking the star button next to your desired product will add it to what's called a "Wishlist" that is unique to your Pyramyd Air Customer Account. This makes it easy to browse for cool stuff now, decide what you want, save those products to one list, go work hard and save up your pennies and then come back to Pyramyd Air to purchase those things on your wishlist that you've been drooling over for God only knows how long OR...just throw the whole list on your credit card with the highest limit and get all your prizes in one fell-, albeit high-interest-bearing, swoop. Be careful with this though. Credit can be a wolf in sheep's clothing if you're lacking a tiny little thing called "discipline." I think discipline is over-rated, but I'm probably not the best role model for most people. End disclaimer. So that pretty much wraps it up. How about some new airsoft guns & accessories to help part you with your money? 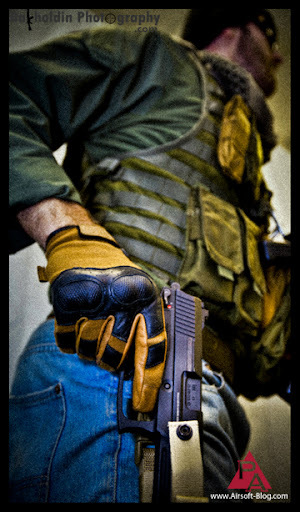 Well, then I guess KWA, as well as the folks at Echo1 and Madbull Airsoft have some great news for you. Here's a very small glimpse at what I've been up to for the last week. New KWA Airsoft Guns: KWA Mk23 SOCOM (Licensed HK USP Series), the KWA ATP, KWA AK47 recoil series, KWA RM4A1 recoil assault rifle to name a few (but not limited to). Yes, there is cause for excitement.